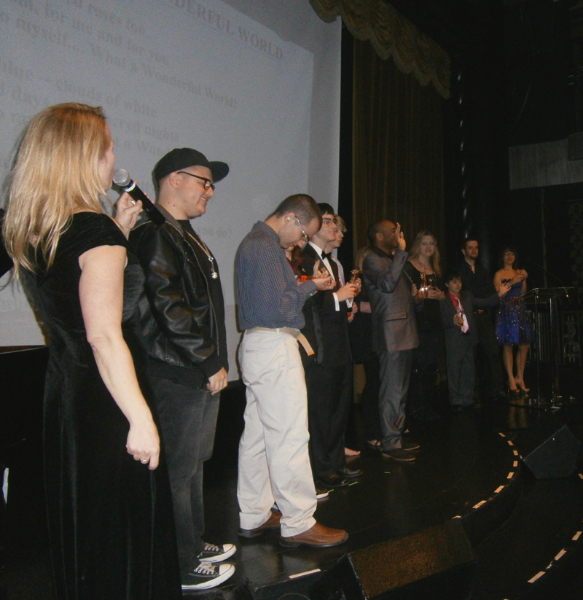 Anticipation and unbridled enthusiasm filled the air at the Edison Ballroom in Manhattan on Monday night, as 14 honorees of the annual Strokes of Genius event gathered to share their exceptional talents in this part concert, part art exhibition event sponsored by the McCarton Foundation. 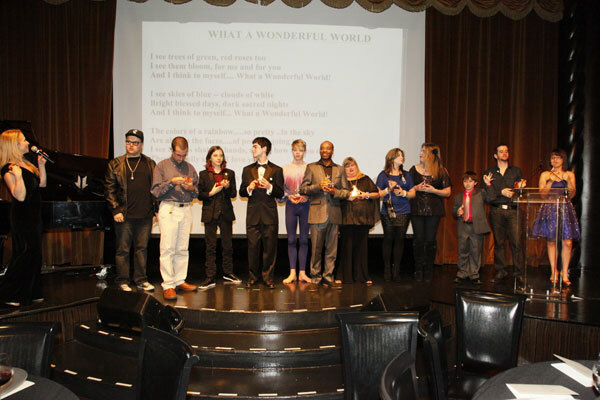 This year’s exceptional honorees include artist, Stephen Wiltshire; artist, Trent Altman; animator/author, Dani Bowman; artist/animator, Justin Canha; singer/songwriter, Kyle Cousins; vocalist, Colin Brennan; singer/dancer/actor, Hunter Brown; dancer, James Hobley; painter/singer, Amanda LaMunyon; singer, Carly Ryan; musician, Matt Savage; singer/songwriter, Talina; singer/pianist, Ethan Walmark and rapper/singer, Rio Wyles. The bustling energy and excited conversations taking place for two hours during the pre-event cocktail event was both intoxicating and infectious. In an aura of low lights, red carpet, artworks by Dani Bowman, Trent Altman and Amanda LaMunyon – along with oodles of yummy hors devours which freely flowed – Dani Bowman also flowed. Looking radiant as ever, and beaming with energy, Dani flittered about the room as if on a cloud meeting and greeting old and new friends alike. At 14 years old, Talina is a singer/songwriter to watch. Her powerful voice and captivating stage presence draws you in. So too does her demeanor. “Talina rolls with the punches. I call them ‘curve balls’ that we purposely throw at her – and as a result Talina is very good at adapting to the life of a singer.“ says dad-as-manager, Lou Toscano who is clearly Talina’s biggest fan. He’s also a smart businessman. “When the kids come together to make collaborations and artistic partnerships, friendships last forever.” He goes on to tell me that he believes through organizations such as Genius of Autism and The Art of Autism, who recognize children and adults with autism for their contributions and talents in the arts, “One day we’ll find the next P Diddy, Celine Dion, or Picasso – here in places like this.” as he outstretches his arm and points to the vastness of the ballroom. I for one, couldn’t agree more. 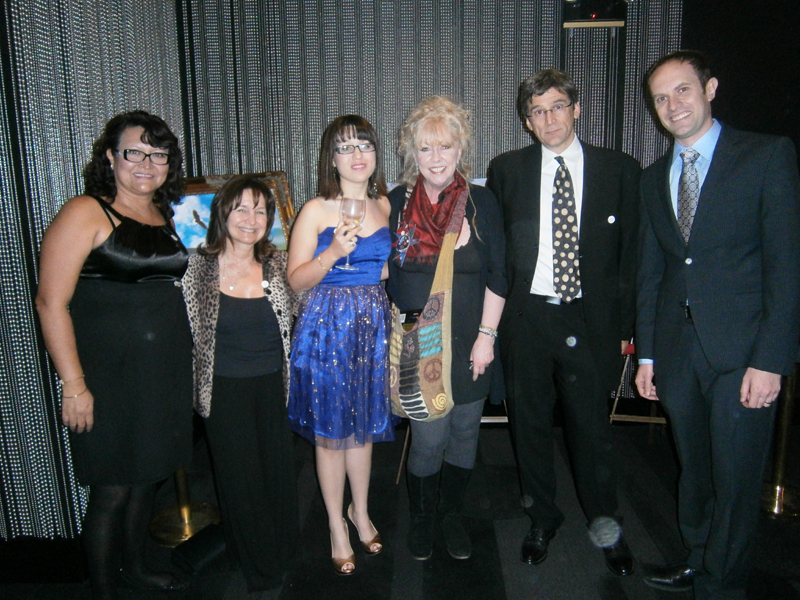 Sponsored by the McCarton Foundation, The Genius of Autism event was originally the brainchild of CeCe Martin. Stay tuned for a future interview with this dynamic pioneer. It is always a joy to talk with singer/songwriter, Kyle Cousins. We’ve produced a couple of collaborative Art of Autism and Autism Movement Therapy shows featuring his live performances with others on the spectrum. A true professional, it’s a treat to see (and hear) him rock out the house, or sing a heartfelt ballad. His writing is prolific, almost outdone, but not quite, by his charisma and charm. His momma-manager, Diane Cousins raised him well! Kyle, who was very excited to be honored at the Genius event was equally excited to tell me about his current collaboration with singer/songwriter/artist, Amanda LaMunyon. I am very impressed by the fact that this team does not let miles or distance interfere with the quality or outcome of their work together. Would-be-moms-and-dads- as-managers TAKE NOTE! We can make friendships and collaborations happen across the country and across the globe with today’s technology. Amanda goes on to say “I sent my lyrics to Kyle for our song, ‘Someone to Love.’ I left a couple empty lines and asked him if he wanted to put music with it. He did and sent it back to me.” Amanda then went into a studio in her hometown in Enid, and with the help of some very talented friends, put down some background vocals to the music. “It was really a learning process for me.” she confides. The pair only practiced for a couple of hours after arriving in NYC on Monday – just prior to performing the song live at the Strokes of Genius benefit… WOW! And so what would Amanda say to other would-be musicians, artists and others on the autism spectrum? I am blown away by her response: “I write, sing and paint from my heart. I do enjoy when others see who I am through the arts because so many times I feel unable to express what I think and how I feel in a way for others to understand. I hope the message of the song we sang (at the event) came through even if someone slips into autism or any other difficult situation… Their biggest hope is for someone to love them enough to hold on for all times and to learn how to love in return.” Amanda is another one to watch in the coming years… Still so young, talented and so smart, right? Turning a corner to a quieter part of the bustling ballroom, I spy Justin Canha, who earlier in the day was in his element, schmoozing and posing for fun photos with his peers. When I approached him, he was quiet, seated alone, texting or playing a game on his phone – appearing to be taking in the scene about him out of the corner of his eye. On approach, I asked, “Are you so proud, Justin? Congratulations!” He looked up, turning his eyes away from his gadget, and produced a big warm smile. “Yes. Thank you. I am so proud.” I have known Justin for many years now, and as an artist myself, I have to say I am in awe. Words cannot express how his art affects me. Suffice it to say I am a fan. His vision, his strokes, choice of lines, subject, negative and positive space, always surprises and inspires. Just then, Justin’s mom-manager, Maria Teresa, and Justin’s ever-supportive life coach (and former client of mine,) Nicole Turon Diaz approach. 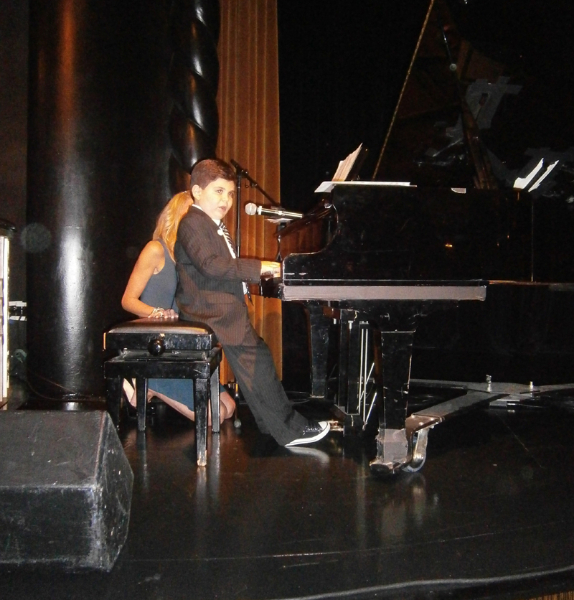 Nicole works with Justin on a regular basis, accompanying him to shows, events, and public speaking. engagements (which they often do together) at local, national and international conferences. I could not help but to throw my arms around them both, giving them a big gushy hug. Gosh I love the amazing powerful women I am honored to know in autism advocacy! Especially moms who have been “doing autism” as long as I have. 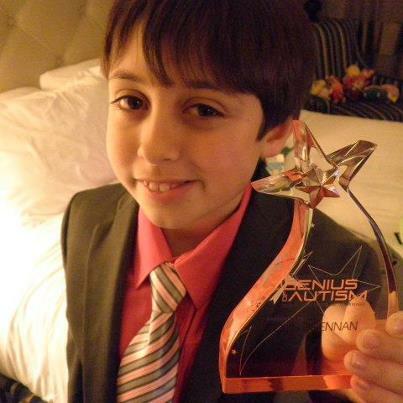 Maria Teresa and Justin’s dad, Briant, have both tirelessly nurtured Justin’s creativity since he was a very young child, supporting him to become a world-renowned artist and a relative pioneer in autism and the arts. An article about Justin, “Autistic and Seeking a Place in an Adult World” written by Amy Harmon in September 2011for the New York Times, is, in my opinion, one of the best articles about autism ever written. Ms. Harmon received an award for the article this October from the Annie E. Casey Foundation, which underwrites NPR. Most especially, I was delighted to hear that Justin’s internship at Sesame Street was a success. I cannot wait to see what exceptional thing comes from him next! At first, Rio Wiles of The Miracle Project seemed perplexed when I said hello to him. I have only seen him in Los Angeles, where he has often been a part of The Art of Autism shows, or at Miracle Project events. “Keri, Keri Bowers from the Art of Autism.” I say. He cracks a wide-tooth grin, saying “Oh… Now I remember you!” I couldn’t help but whisper to him that I was most eagerly awaiting his performance later – as I love this young man’s music. Rio is sooooooooo ready for the big time. His soulful raps are penetrating, well written and performed with a detailed passion. He did not disappoint later on in the evening when he commanded the stage and belted out his powerful licks to the audience’s delight. 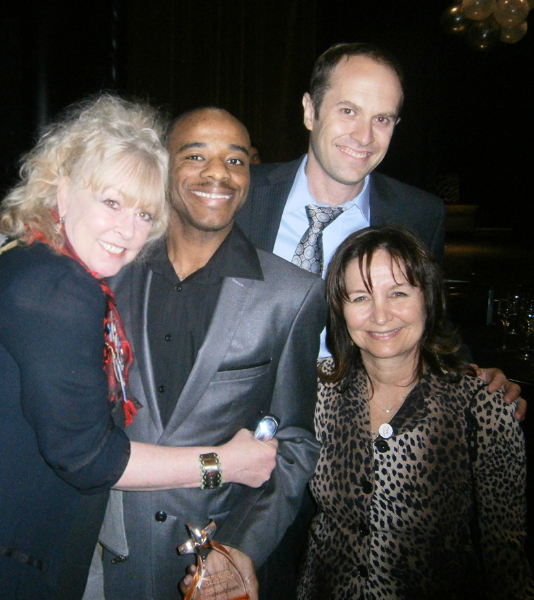 Upon taking his onstage bow, Inspiration Award Honoree, Stephen Wiltshire flashed a smile so big it captivated the audience and could be warmly, if not physically “felt” across the crowded ballroom. When I asked Stephen what he thought about being honored for the Inspiration Award, he offered “It feels good, really good. I’m glad to be here.” Stephen’s cityscapes and panoramic architectural prints, which he often draws from memory (as seen in the exceptional short film “The Human Camera”) have indeed inspired many around the globe, none the least of which is me. My son Taylor and I had the privilege of interviewing Stephen in his London gallery a few years back for our film, ARTS. Ever humble, and quite matter-of-factly, he warmly shared each detail of the inspiration he himself found in creating each piece of work he showed us. He also shared – as our welcome and parting gifts – his infectious, inspirational smile. I wish there had been more time for me to meet and greet all of other the honorees, but alas it was time for us to take our seats downstairs in the ballroom. Placed at table number 1 with the ever beautiful Elaine Hall, founder of the Miracle Project, and with my dear friend, Aaron Feinstein, Director of the Miracle Project New York/Brooklyn, and founder of Action Play, our view to the stage was outstanding. Though I felt quite sad that I did not get to meet all the of the honorees, in lieu of personal introductions, I found the performance aspect of the show to be chill-inspiring. Outstanding, actually. Choreographed beautifully, this was a not-to-be missed event. There is something magical that happens when the lights go up and the audience awaits expectantly for the performance to begin. For those with autism, it is often the case that no matter what has gone on in their day, whatever challenges or distractions they experience before or at the moment of no return, when they must step into the light – they walk tall, erect and proud onto the stage to give us their hearts and passion – a gift for us to see, hear and behold. For me, as a producer of similar shows, this is a moment of powerful magic. There is a relationship that occurs between the performer and the audience in the light. I witness a quiet internal release that comes forth in the performers the moment the dance begins, the song is sung, the words uttered, or the instrument played. It is a metaphoric – if not literal dance – where autism is invisible and grace is all we see and feel. It is also a moment when we, as moms, dads, uncles and aunts-as-managers and collaborators swim in joy and know without any doubt that the time we spent nurturing our children, caring for their fears, supporting their quirks and growing their passions is rewarded as we witness these incredible moments. There is no better way in my opinion to raise the self esteem and socialization of children and adults as I have seen occur in the arts. By the by, I must say that I have witnessed kids with no language or obvious grand talent also experience the rich rewards and esteem of being part of a group up on stage with everybody else. This type of thing occurs everyday, for example, at The Miracle Project. So if you are thinking “Yea, Keri, well my kid has no obvious talent.” then I sweetly and emphatically encourage you to reconsider your own personal vision for your child. While at the event, I was able to talk to Dr. Rosa Martinez, who is the Founding President of Strokes of Genius. Talking with Rosa is an exciting adventure. She is so full of compassion and enthusiasm for her work with individuals with autism, it is compelling and telling. In 1986, Dr. Martinez began teaching six students with classical autism. Each year thereafter, she found a puzzling detail: although her students appeared to be “in their own world” and had no obvious understanding of the world around them there existed uncanny artistic talent amongst them. One student played brilliant concertos on the auditorium piano – that is when she could run away to sit at the piano bench. Another ran over to a lady sitting on a park bench during a school outing and tapped her broach naming the sound that resulted as the key F-sharp. He turned out to have perfect pitch. Another would take apart and unscrew everything in his path in seconds – including the toilet! Still another drew bridges with architectural accuracy even though he had never seen them. Rosa told me “Everyone knew about the disabilities, but no one knew or understood the abilities.” She realized that the arts were synonymous with social communication and thereafter created Strokes of Genius – to share the diverse talents of those with autism and provide a comprehensive vehicle for inclusion and societal contributions. This January, The McCarton Foundation will launch Dr. Martinez’s inaugural branch of the “Train The Talent” (TTT℠) Art Studio at the McCarton School. They will offer art classes designed to cultivate the artistic talent of young people on the autistic spectrum. The fine arts program, developed by Dr. Martinez, creates awareness of “ability” rather than the “disability” associated with autism. Strokes of Genius is a non-profit organization that empowers individuals on the autism spectrum. Dr. Martinez curates art exhibitions in the United States and has featured the artwork of luminary artists including Temple Gran din, Donna Williams, Stephen Wiltshire, George Widener, Kevin Hosseini, Gregory Blackstock, Ping Ling Yeak among many others. 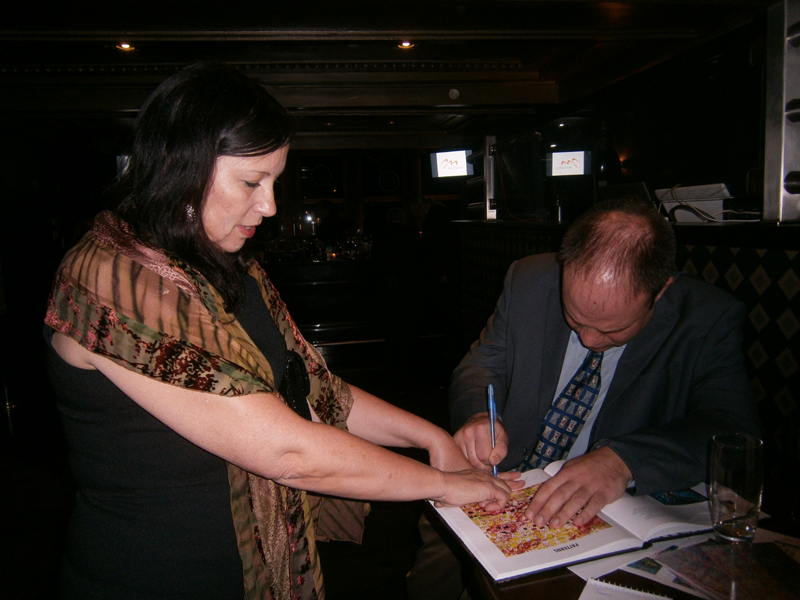 Dr. Martinez, who was the editor of the original Art of Autism book is truly an inspiration to all of us. Be sure to Google Dr. Martinez if you’d like to learn more about her program or contribute your support. I reflect upon the evening, smile and think back to my own story with my son, Taylor. I am reminded of a day, back in 1989 when I was painting on a large canvas. Taylor – who is now 23 – was six months old at the time and could not bear for me to touch or hold him. There was no autism mentioned on the front page of newspapers in those days, no internet, and there would be no correct diagnosis for him for six long years of seeking answers to understand Taylor ‘s bazaar quirks, delays, and multiple challenges. Suddenly an instinctual urge filled my head and heart. My inner Goddess cried out to me: Put paint on Taylor’s little finger tips!. 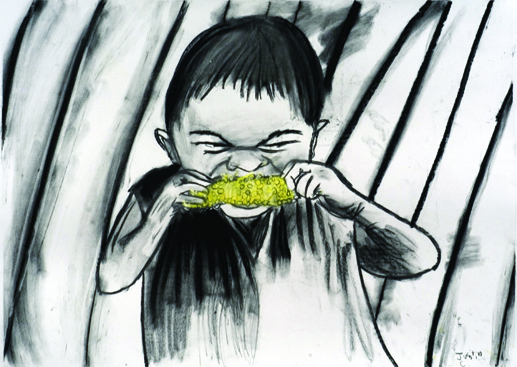 I began to splay yellow, red and blue paint on his fingers. Cupping his noodle-like hypotonic body firmly in my arms, I faced him toward the canvas as he struggled to get free of my hold. Not relenting, I grazed his finger tips across the canvas – with traces and waves of color bursting forth. He did not like this, not one bit. The “committee” in my head (as I call them) admonished me: What are you doing, Keri? What the Hell? My girl Goddess, far more wise than my annoying, nay saying committee replied, You don’t need to know, Keri. Just keep doing it. After many times of repeating applying paints to Taylor’s hands over the next months, he began to accept the paint on his hands. As he grew he even began to enjoy the feel of the paint and making swirls of color on canvases. Today – duh – we call this sensory integration. I went on to work with Taylor in drama, music, dance, and other forms of creative expression, I’d sing social stories to him. Ultimately, the crowning achievement – as he says today – was the making our film, Normal People Scare Me. “Making this movie changed my life, mom.” he recently told me. The early work with Taylor in the arts naturally led me to work (now for over 20 years) with others on the autism spectrum in the arts. Through the various programs I created over the years I have had the privilege of meeting some of the most awe-inspiring individuals, parents (read managers), an others – who continue to inspire me and the work I love. Taylor moved into his very own apartment a couple of weeks ago. I am so proud of him, his efforts and hard work. Though Taylor continues to struggle with many things, he also has an amazing attitude towards his life, who he is and what his limitations are (at least for now.) Taylor hopes one day to be a writer. I hope he will see that happen for him. And so I dedicate my words in this text to him – he who is my muse and inspiration – with a shout out to his little brother, Jace (The Sandwich Kid) who is always there to support Taylor and me in my work in autism. Of the fourteen artists honored at Strokes of Genius, we at The Art of Autism are excited and proud to note that five of them are a part of The Art of Autism Collaborative, including Trent Altman, Dani Bowman, Justin Canha, Kyle Cousins and Amanda LaMunyon. How lucky we are to be in collaboration with one another on a joint mission to expand our understanding of the importance of the arts in autism. We are momma and papa-bear autism advocates/managers, chief cooks and bottle washers. Working with you who are self-advocates is our mission – our passion. And we adore you! We are proud to know you and to watch as your art and popularity grows. Your ability to express through art, music, dance and other creative mediums warms the world. Your art expresses what words sometimes cannot convey, and we see and acknowledge the illumination and support you give to others through your work. For those of you not yet a part of our collaboration which is now 260 artists with autism strong, we extend an invitation for you to join us as we show the world a part of autism that exudes grace, beauty and talent. Contact us at theartofautism@gmail.com. …with special and warm thanks to Kelly Green, Autism Highway, Joanne Lara, Autism Movement Therapy, PAUSE4kids, Elaine Hall, Diane Isaacs, Aaron Feinstein, The Miracle Project, Yehudis Silverman, Eli Laber, The Friendship Circle (Agoura and New York,) Linda Gund Anderson, and all the mothers we know (you know who you are) who love and support your children everyday of their lives! Thank you Keri for your presence at the Genius of Autism event. You always bring such energy and enthusiasm everywhere you go. What a gift! Thanks for the kind words about Justin, Briant and I! You’re the best!